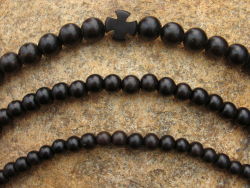 The beads used in this popular line of wooden prayer ropes are made from hand-carved olive wood, black ebony, tiger ebony, bayong and mamalis wood. In addition to the standard lengths—33-bead, 50-bead, 100-bead, we also offer 12-bead and 300-bead lengths. 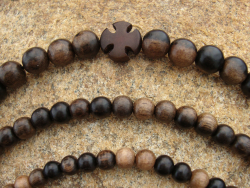 Noteable are the cross-beads which are made from the seeds of the buri palm tree. The cross-beads are inserted at the following places in the prayer ropes: 33-bead—after every 11 beads; 50-bead—after every 10 beads; 100-bead—after every 25 beads; 300-bead—after every 100 beads. 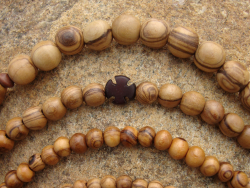 The prayer ropes are adorned with a wooden pendant cross. Bead size options range from 4.5mm to 8mm. The beads are individually inspected and strung by the sisters, to insure the highest quality. 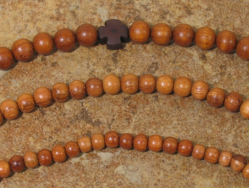 The 300 wooden bead prayer rope is an economical alternative to a knotted 300. Some of our customers who have lost some feeling in their fingers find the wooden beads much easier to distinguish, and the large beads are sometimes preferred by those with large hands.